Wakhi culture. A student and young growing mountaineer, enormous passion for mountaineering and seeking ways to cherish my goals! 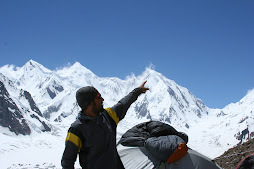 since my birth in the mountains and among glaciers (KARAKORUM/SHIMSHAL 3300m) and my early involvement in the mountaineering society, by and by it enriched in my blood, the craze, love and passion for mountaineering grew many folds as more then my expectations, my first climb of 6050m peak Mingligh sar is a record, being the youngest to climb any peak such as 6050m high in my country (Pakistan). it then pushed me times and again to go for more ventures, even having no resources as well as permission, it was time, when i hardly had a shoe of leather even not plastic climbing shoe! My parents are very strict in not allowing me to climb, in the beginning, since they have phobia being far away (me) in the mountains and more the close association and their love for me. Now their support and guidance and realization of fact that I am working for a great cause to promote women adventurism in my country and also encouraging and become role model for the youths of my country, making and breaking myths and barriers, going in to the adventure sports ,particularly mountain climbing. My love, passion and respect for adventure and mountains are unparalleled and unmatched to any other hobbies in my life. This love for mountains forced me now to go for some life time dreams which have been nestled in my mind and heart for last many years, right after several 6000+ climbs! My main life objective is to climb all fourteen 8000m peaks in the world and become the first Pakistani climber to make all fourteen 8000m peaks summit, I would wish and pray for the accomplishment in graceful and nice way. I do believe with my current position it’s not very viable, however my love for mountaineering is as strong as anything hardest…. And it’s my believe that my love and passion will find a way and people who will help me out in this mission of my life! The second main life objective is to promote women adventurism in my country (Pakistan) and also introduce this mountaineering culture among the youths of this country, being the role model and leader, in the country I live; we have enormous potential and talents. Though i am not a very skilled and trained mountaineer but my struggle is both way hard, and trying to be very much adept in this field! Through my mountain climbing, I would definitely work for peace in the region and in the world. my every single expedition I will dedicate to the world peace and humanity .addition to my objectives I have an idea to work for KARAKORUM REGION less privileged children and provide them an environment of life basic necessities, from basic education to other requirements, to work for the children of mountains, I do believe and appreciate some of my best friends those who have similar opinion and motif to assist the people for better future of this far flung and remote area people of karakorum,they encouraging me as well as assisting to go for the great cause, some among the best Tania ( The ROCKER)! And more the one for life time, Tina! Who are my energy and my strength! To obtain my objectives, I have now planned an Expedition of climbing three 6000+ peaks in October. Out of these three mountains, two of them are unclimbed and one is unnamed as well as unclimbed, these climbs are my preparation for 2010 double header. The first phase of my training and preparation will lead me to next preparations in March /April. NAMING THE MOUNTAIN AND THE ROUTES AFTER THE SPONSOR! 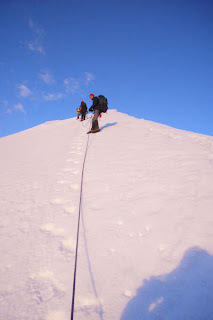 My aim is to name the unnamed mountain to the enterprise or firma those who can sponsor me this expedition; I will also dedicate the route to the mountain which is not yet climbed by any mountaineer. All three mountains are in the extreme Karakorum Range, Hunza/Shimshal. Near to china border. The two peaks are technical, the third one is semi technical but demanding. From the top of the two peaks, K2 and other high mountains can be seen; particularly very close view of K2 and other 8000m is very possible from the summit of unnamed and unclimbed peak! very easily viewed; the peak is only twice climbed. 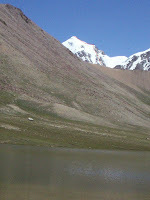 The first ascent was made by Shimshal mountaineers and the second ascent was made by German Expedition. Since then it’s not climbed! 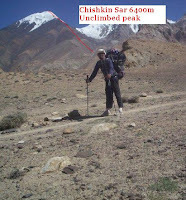 Chashkin Sar: is located in Maidur valley an easy access from Purian Sar, the peak has a magnificent view, while passing on to Shimshal pass, the peak is a dome type, the peak route will be from the east ridge! this peak seems to be easy but the bad curves condition makes it more difficult and dangerous, however this peak has not yet climbed, and the plus point is that its the highest in this area,the peak access is very easy from both ways, three days trek from shimshal Via tang and same from shepodeen pass, the peak main location is in Maidur area, which is awesome and beautiful, plenty of Blue sheep and other wild birds are easy watchable!the beautiful view of this peak is from PurianSar,which is gate way to shimshal pamir,(shimshal pass). view from the pass. A tall standing peak between to dome type peaks, in the far left peak we climbed for the first time in 2008 and named it Golden Jubilee peak, which is 6130m. 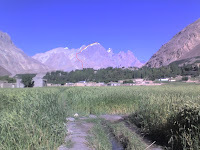 My partner is a 19 years old girl , who belongs from the same valley from where I am, Shimshal valley in the Extreme north-east of Pakistan and in the karakorum.the girl is very much interested to promote women adventurism in Pakistan with me, and therefore she is going with me on this autumn venture, she would be the only and first Pakistani girl to climb three mountains at one time, and more she would be the only first girl to climb a 6400m peak, this is a plus point of this autumn venture, the girl with me is to break all barriers and myths to pave a new way for women of this country to participate in the mountain climbing and adventure sports. This would be a break through in my country of participation of a girl in the autumn expedition, however I have organized a joint expedition in the summer this year, and a girl named Saadia sharjeel took part in the expedition, but couldn’t make her reach beyond camp I at 4647m. I do believe this venture will be a new history. Since the cost of mountain expeditions are quite expensive, particularly in autumn which turns to be winter expedition in the Karakorum. Hence being applying for my first sponsor and for long term cooperation, the money I am seeking and demanding is much less comparative to other expedition expenses. It’s just the expenses for the expedition not applied for making money. This costing is free of any compensation or reward the entire cost which is made covers the expedition expenses, and its believed the success will bring cooperation and sponsorship to my 8000m expeditions and next year double header,it will further be discussed in detail. Apart from this I have lead joint Pakistan-Danish Spantik expedition 2009, I am also doing rock climbing, and in the past tow months I can climb Grade 6a. And still taking the training! The club where I am taking the training is called Margalla Rock climbing Club; it’s a new established club under German instructor. Addition to it, I have attached my recommendation letters from the people with whom I have worked. MY LINKS WHERE I CAN ADVERTISE THE COMPANY OR SPONSOR IN TERMS OF NAMING THE MOUNTAINS AND ROUTE AFTER THE FIRMA OR ENTERPRISE. My face book Community link! REPORT OF EXPEDITION TO SPONSOR! A detailed report of the expedition from its launching ceremony, climbing, and ending ceremony will be sent to the donor. A documentary movie and pictures will be taken during the expedition, a special thanks letter will be sent to the donor. Advertising can be made if the donor sets any criteria to advertise any product of the company in the shape of cloths, attached monogram of the company for the expedition, banners or any sort that the sponsors design. 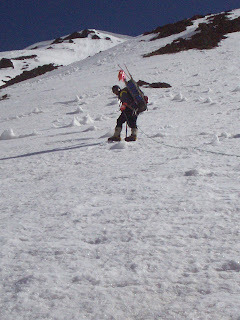 Advertising can be made while climbing on the mountain and during the trek. A special letter will be sent to lonely planet and K2climb.net.Everst news and other renowned adventure newspapers and bogs, regarding the expedition, sponsorship, name of the mountains routes of the mountains. i beleive there are people ,who will definitely help you out for getting your main objective! best and good luck!